I tried to get this post up last night, but the kids and some extra work needed me more. This morning as I sit writing, I have two kids running around half-naked and one who needs breakfast. In 17 minutes I have to run the kids to school and deliver them to their classrooms, come home clean, work a full day and get dinner together. In the afternoons I pick up the kids, run to any extracurricular activities or play dates, run errands and return books to the library. 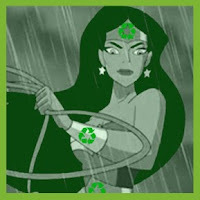 Then there's the local sustainability group I've been enjoying and the Green Scouts I'm volunteering with. It's not a rough life by any means, but it is insanely busy these days. Lately I've neglected completely abandoned my personal blog and haven't done a spectacular job here either. While we've stayed true to our green principals, we haven't attempted anything new or exciting in the name of sustainability. So, as has happened with many an eco-hero before me, I've decided it's time to pass the cape. I'll still be around with a guest post from time to time and I hope to have some homemade gift ideas and tutorials for you this holiday season. I've enjoyed my time here at the Booth so much. Thank you all for making it special! Will miss your entertaining and insightful posts, Kellie. Hope you pop in from time to time. Definitely will miss your writing! You're still a superhero even if you're not writing at the booth! Good luck in life and all your green adventures. Hope to see you around! Is my conference green or just cheap?